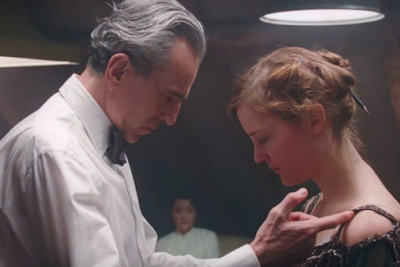 “I have given him… every piece of me… He’s the most demanding man”, declares Alma (Vicky Krieps), about the very complicated fashion designer, Reynolds Woodcock (Daniel Day-Lewis in what will be his final performance), during the opening scene of Phantom Thread. This introduction and the phantasmagorically romantic music by Johnny Greenwood (Radiohead) firmly establish the 1950’s universe of the “House of Woodcock”, an exclusive fashion design studio that caters to the richest and most demanding women in Europe, where everything revolves around its creator (Reynolds), who requires utmost perfection down to most infinite detail. Inspired by the life of legendary Spanish designer, Cristóbal Balenciaga, Paul Thomas Anderson weaves a chamber drama, which unfolds mainly in the asphyxiating House of Woodcock. It dissects the delicate balance between giving and taking that exists in every relationship, as it questions the possibility for a man, monastically dedicated, body and soul, to his work, of ceding enough space in his life to allow for love, beyond the mere presence of a muse. Anderson’s British influences are evident, Hitchcock (specifically Rebecca), David Lean and most importantly Powell and Pressburger. The camera movements, character demeanor and the overall sumptuousness that Anderson imbues to the film, elicit the weird sensation of watching a hypothetical Michael Powell movie, the one he could have made if his career had not been truncated by the general lack of understanding of Peeping Tom (1960, now widely regarded as a masterpiece), upon its original release. The clash between Woodcock, a meticulous and self-absorbed man, and Alma, a seemingly simpleminded immigrant waitress, could not happen without repercussions to both of their lives, which create a not quite subtle power struggle in the relationship. As Alma clearly warned him during their first date, “If you want to have a staring contest with me, you will lose”. The magic of their encounter resides, for her, in the possibility of looking at herself through Reynold’s eyes, and feel, for the first time, that she is perfect (in his words). In this strange convergence, the name Alma (soul in Spanish) might not be a simple coincidence, since, regardless of his great talent, it is precisely what Woodcock seems to lack. A soul. The third side of the triangle in the relationship is the always-vigilant Cyril (Lesley Manville), Reynold’s sister, who makes House of Woodcock’s clockwork like operation possible, to facilitate her genius brother’s creative state. Under Cyril’s stern gaze, Alma constantly seems like a deer caught in the headlights, always trying to pass another test. The photography, done uncredited by Anderson, is a key element in evoking both the period and the emotional intensity of the piece. Using 35mm film, blown up to 70mm (which exponentially increases the film grain) Anderson captures the required intimacy, while achieving an exquisite look that portrays the British lighting and scenery to perfection. 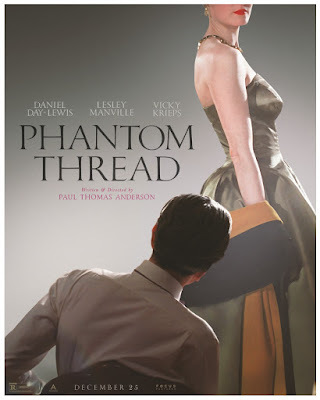 As the titular phantom thread (the sensation seamstresses felt after repetitive hours of work), Anderson’s film will remain in the mind of the viewer, as a specter, haunting its dreams.